Helena slot is a 10 pay line 5-reel game very typical of our Austrian friends Novomatic along with the potentially lucrative single bonus round most of their games tend to offer along with high volatility. Other examples of this model for Novomatic include Faust slot, Lord of The Ocean and Lucky Lady's Charm. 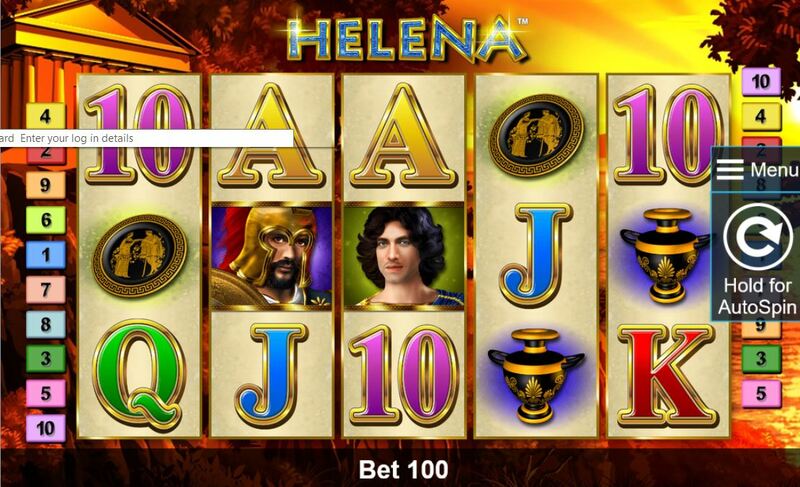 Helena is in fact Helen of Troy and appropriately the theme reflects this with its icons and symbology. I must say this balances out slightly the rather excessive catalogue of Roman-themed slots over the range of developers we see, although Playtech have Gladiator and IGT do have Treasures of Troy. There is also a departure from the standard Novomatic sound effects; we have a drum beat reminiscent of an ancient marching procession overlaying the reel spins. Now we know Troy was ultimately conquered by the Greeks but Helena was reputed to have been a rival to Cleopatra for her beauty and this is reflected in her status as the game's Wild and highest-paying symbol at 1000x stake for 5-of-a-kind. Helena also doubles any winning combinations she appears in. The Trojan warrior and the handsome prince pay 75x and the lowest card symbol 10x stake. The icons all appear singly on all reels as do the scatters in the form of a classical Temple. Even the perpetual 2-scatters will award a little token of 2x stake as well. 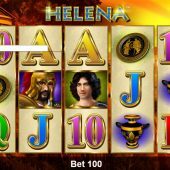 These pays will also indicate to you Helena is quite a volatile woman, even more so when we see 3 or more Temples in view to trigger her free spins bonus! Having landed 3 or more Temple icons anywhere, you will be awarded 15 free games all at 3x multiplier the same as you would see in her historical conterpart's Cleopatra slot. If Helena is benevolent and awards herself to you over 5 reels, there is a massive 3000x bet on offer and don't forget other wins with her appearing will be effectively multiplied by 6x due to the doubling Wild. There are retriggers possible too with no limit.